By my estimation, Democrats start out the 2018 election with majorities in the bag in both houses of the General Assembly. In the Senate, Democrats have very safe bets in 24 of the 47 seats, as compared to just 14 for the Republicans. These 24 alone would be just enough to give the Democrats a Senate majority. In the House of Delegates, Republicans have a base of 45 seats, or just under one-third of the total. The Democrats look ready to sail back to the majority with a base of 74 seats, or three more than needed for a bare majority. 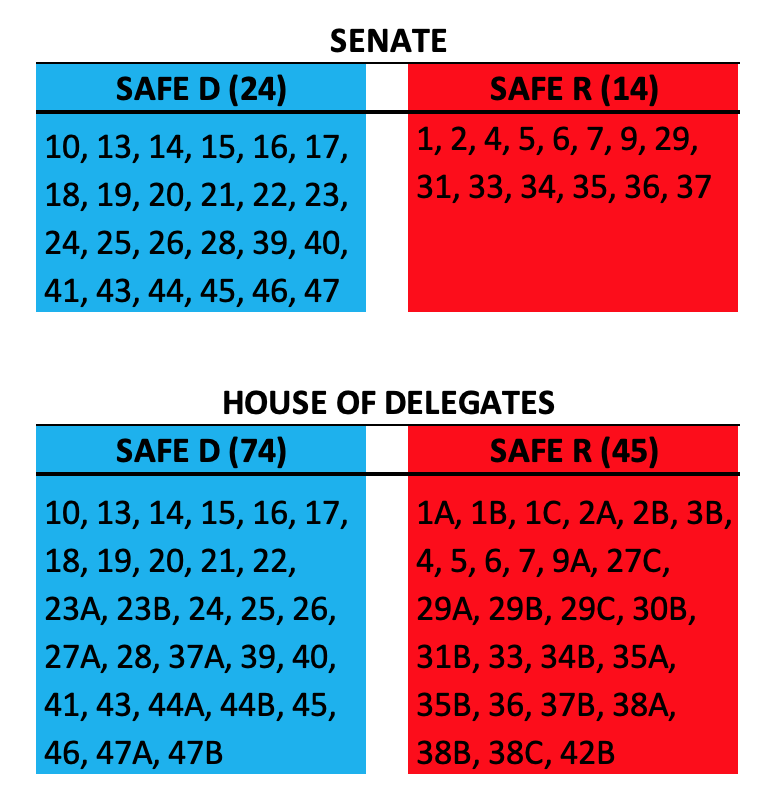 I’ve classified as “safe” here any seat that the appropriate party won in the (1) 2014 gubernatorial election, (2) 2016 presidential election, and (3) 2014 state legislative elections. I deemed the latter condition as met only if the party carried all of the seats in the Senate and House of Delegates up for election in the identical boundaries. Republicans have outside hopes in the District 28 Senate race, where incumbent Sen. Mac Middleton was upset in the primary by Arthur Ellis. However, it seems unlikely that Republicans will take a seat that Clinton won by 23 points. Brown won it by only 4 points but the seat has trended more Democratic since 2014 and the electorate should be less favorable to Republicans this year.